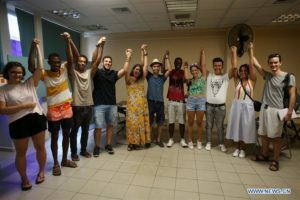 ATHENS, Aug. 26 (Xinhua) — Josephine Ngendakumama from Burundi has a story to tell, as a migrant woman who escaped from war and violence in her country in the 1990s and came to Greece to encounter color racism and discrimination. “Racism at work to curse you due to your color and to do a job that you don’t like hurts so much that you can get sick,” she told Xinhua, who took care of elderly people to make a living and raise her family. 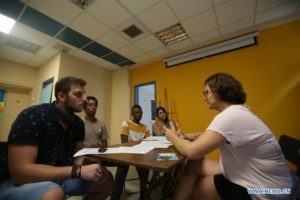 Stories like Josephine’s came to life at a Human Library event that took place in Athens during the weekend, aiming to open a dialogue about racism and volunteering in Greece. Started in Denmark more than a decade ago, the Human Library idea has been spreading to libraries worldwide. 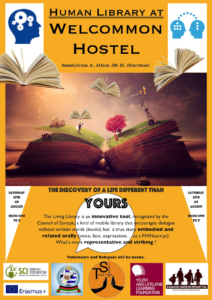 It is an innovative tool and method of experiential education in human rights, recognized by the Council of Europe, that stimulates a regular library to a library with real people who are “on loan” to readers. 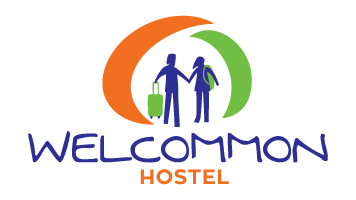 Volunteers from various European countries with refugee communities in Athens teamed up under the two-month project “Together Stronger” run by the NGO Service Civil International-Hellas (SCI Hellas) and the Greek Forum of Refugees (GFR) to promote the idea of volunteering, familiarization with different cultures and social inclusion. As part of their project, they decided to organize a Human Library event with volunteers and refugees who have encountered racism as human books, to break stereotypes. “The Human Library has all the rules of a library – only the books are people. The reader can choose a book from a catalog, they sit together in a quiet place and can listen to its story and interact,” Yiota Arvaniti, project manager at SCI Hellas said. A reading at a Human Library does not require a paper book, but people who intend to share their experience to fight against prejudice and empower diversity. The aim is to provoke the reader’s confrontation with his/her prejudices and stereotypes to start thinking differently. “I want to help others not to give up. When you are a refugee in a foreign country, you may not stand it and even think to kill yourself. I shared my story to show that we need to be strong and struggle,” Ngendakumama said. Like her, Iuliia Bumagina from Russia, who is a short-term EVS (European Volunteer Service) volunteer working with refugees in Athens, decided to participate as a human book. “I think it is quite inspiring. When you listen to someone’s story, and it is quite personal you can learn from this person, and it is the best way to learn,” she told Xinhua. 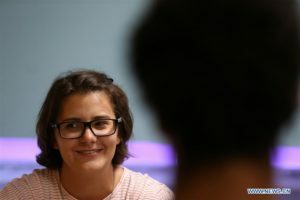 As a human book, Bumagina decided to narrate her story as a volunteer and her decision to become one at the age of 12 with all the difficulties that she confronted. “I come from a country where volunteering is like a brand-new thing, and people use to treat volunteers as a free labor force, but it is something more than that. I have always had this strong feeling of justice, so it is very important to work with people who are discriminated and to show them that we support them and also to enlighten the world,” she said. The public could check the “human books” for 30 minutes and discuss with them about their experiences. Mohammed Keita from Guinea participated as a reader at the event and was impressed with Bumagina’s book so much that was tempted to join the next Human Library event as a book. “When you read a human book, you feel the experience that a person has gone through. Sometimes you can see your life; Also you can say I am related to this person, because we have all the same experiences. You can see some kind of connection between you and you feel closer to the person who is the book,” he explained. “It was very personal, moving and very educational for the reader. I was with bated breath, because you don’t want to disrupt his/her line of thoughts and I put myself in their shoes; I was wondering if I could do the same. It takes courage and bravery to tell all these things about your personal life in front of foreign people,” said Manto Baboula, another reader.